Here's an interesting short news item about potential changes to Israel's tax system aimed at privatized kibbutzes. In short, the proposal will restrict "collective" tax rates to those few kibbutzim who have maintained their communal economies (what are known as kibbutz shitufi) and/or have no greater than a 25% differential between the best and worst paid members. For the majority of kibbutzim who have undergone "privatization" or decommunalization" (also called shinui or "The Change"), members will need to pay individual income taxes rather than the collective communal tax (sometimes negligible or zero) that has benefitted kibbutzes for decades. Ha'aretz offers an even more detailed look at the potential consequences here. While much attention over the past year has focused on the experiences (and location) of Bernie Sanders as a kibbutz volunteer, it turns out that another major politician did a tour of duty on a kibbutz: Boris Johnson, the blonde-bemopped former mayor of London and now post-Brexit U.K. foreign secretary. He sounds (and even looks) much like I did as a hapless foreign kibbutz volunteer. 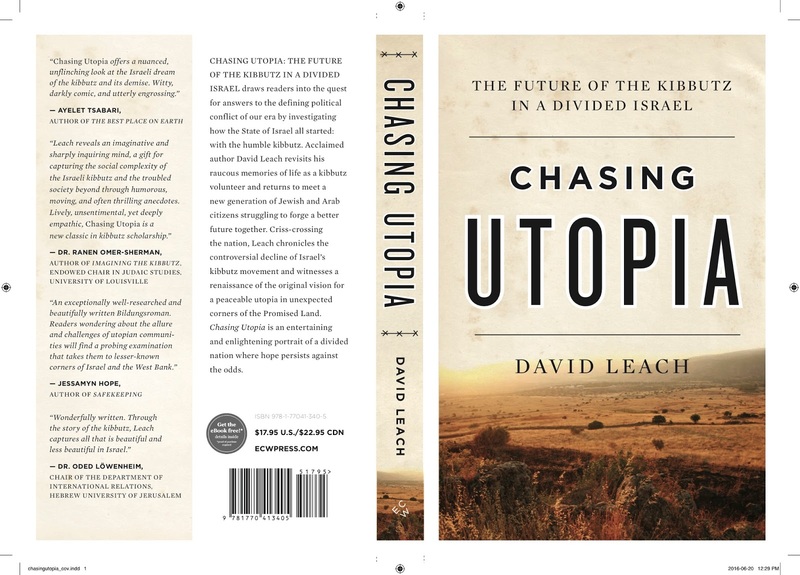 Speaking of blurbs, I also got a look at the (almost) final front and back cover design for the book — and it's gorgeous. I was thrilled by the integration of my photo (overlooking the Hula Valley), the title and subtitle fonts, and the four wonderful blurbs from two academics and two fiction writers... all of whom I deeply admire for their own writing and thinking. N.B. : One final change made after I saw this draft was removing the barbed wire on the spine, which we felt didn't suit the (mostly) hopeful spirit of the manuscript. And so it begins... the anxiety over book reviews! 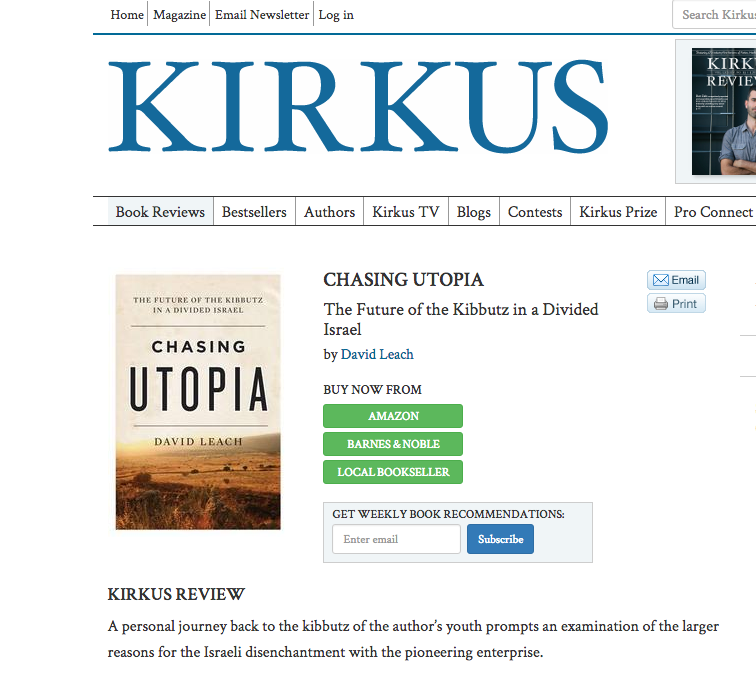 With the official launch of Chasing Utopia still two months away, the book got its first early review from Kirkus, the influential trade magazine... and I was relieved (nay, thrilled) that the reviewer liked the book. Read the full review here. If nothing else, it gives me something to salve my ego when the inevitable lukewarm or antagonistic reviews start to come in... I've got no illusions that everyone will share Kirkus's opinion about a book on a topic as deeply divided as the history of Israel. And I look forward to adding the final line from the review to my collection of blurbs: "An eye-opening look at an Eden of eco-villages gradually giving way to economic exigencies." British acting legend Helen Mirren was recently honoured in Los Angeles at the Israel Film Festival and spoke about her experiences in the country—including a stint as a volunteer on Kibbutz Ha'on six months after the Six Day War, when the first wave of foreign visitors arrived to kibbutzes across Israel to fill in for members called up for Army service to defend the country. She recalls sleeping on the beach in Eilat—a pleasure that I shared, too, although two decades later. "That visit to Israel was one of the important building blocks, in my life," she told the audience. "The courage and the commitment of those early people working on the kibbutz that I was luck enough to meet briefly. These building blocks that make personal lives and that make countries." Kibbutz Ha'on, however, is no longer a kibbutz. In 2007, the indebted community returned its land to the state and became a semi-cooperative moshav instead.